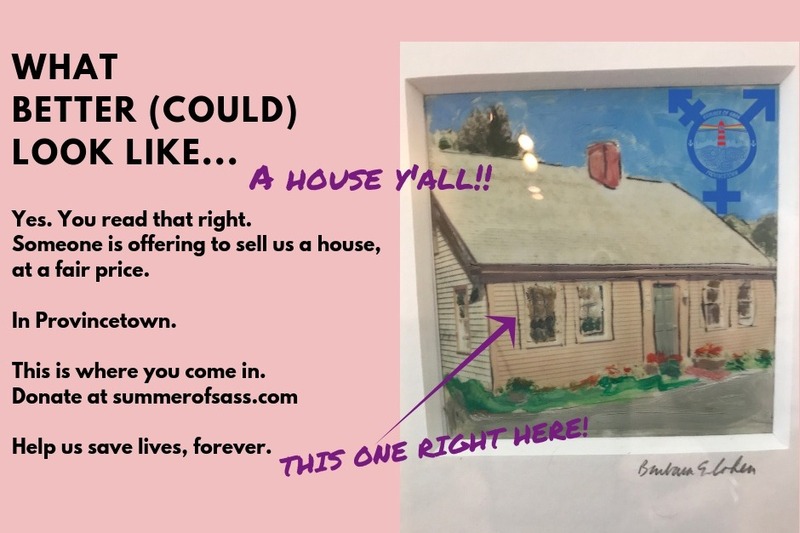 Fundraiser by Kristen Becker : Summer of Sasss Needs a HOUSE! Summer of Sasss Needs a HOUSE! The program matches young people with summer jobs, provides transportation, arranges a place to stay, and offers access to professional counseling. Participants are expected to contribute financially, but they can’t be expected to cover all expenses. Housing is the biggest and most costly challenge. Founded in 2017 by comedian Kristen Becker, Summer of Sass is a seasonal work program geared toward LGBTQI young adults 18 to 20. Sass brings participants to Provincetown, Massachusetts to experience an accepting environment that is literally a safe harbor for those who may never have experienced a supportive community. Sass matches participants with jobs, arranges housing, and provides transportation and access to counseling. For more information, visit SummerofSass.com. Summer of Sass founder Kristen Becker sums up why Provincetown is uniquely qualified location to help steady the ships of queer folks.